UPDATE: McAfee Released, Leaving Guatemala For The U.S. : The Two-Way The anti-virus software pioneer is wanted for questioning about a murder in Belize. He says he's innocent and is being persecuted by corrupt authorities. Detained for allegedly illegally entering Guatemala, he's now free and on his way to Miami, he tells Bloomberg TV. 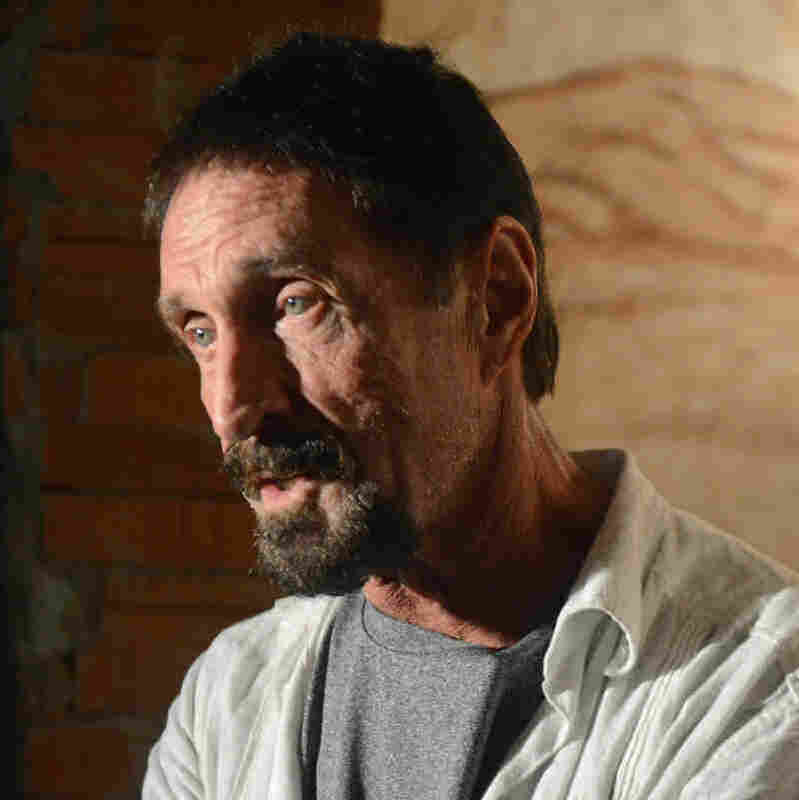 UPDATE: McAfee Released, Leaving Guatemala For The U.S.
John McAfee, the anti-virus software pioneer who's wanted for questioning in Belize about the murder of a neighbor, tells Bloomberg TV that he has been released from a detention center in Guatemala and is flying to Miami. He also says he has apologized to Guatemala's president for "putting him into a very slippery position." McAfee, who says he's innocent of the murder and is being persecuted by Belizean authorities, was detained for illegally entering Guatemala. John McAfee, the anti-virus software pioneer who's wanted for questioning in Belize about the murder of a neighbor, is going to be released from a detention center in Guatemala later this morning, according to the blog he and his supporters have been updating while in custody. John McAfee, in Guatemala City before his detention. "He has not divulged his plans," says the blog post. According to The Associated Press, one of McAfee's lawyers, Telesforo Guerra, "said Tuesday that a judge has ordered the software company founder released. ... McAfee has said he wants to return to the United States with his 20-year-old Belizean girlfriend. Guerra said that would be his client's best option." McAfee, who says he's innocent of the murder, also says he's being persecuted by Belizean authorities — who he accuses of corruption. Belizean officials have not issued a warrant for his arrest, according to news reports. He was detained in Guatemala after he allegedly entered that country illegally. In related news, McAfee has also announced he is "terminating his relationship with Vice Magazine" because he suspects Vice deliberately left geolocation data embedded in a photo of him so that he would be detained in Guatemala — and Vice would get the story. As Eyder wrote last week, "the magazine posted a picture taken with an iPhone" and as The Next Web explained, the location metadata wasn't scrubbed.